Already Knee Deep in Iquitos...Literally! 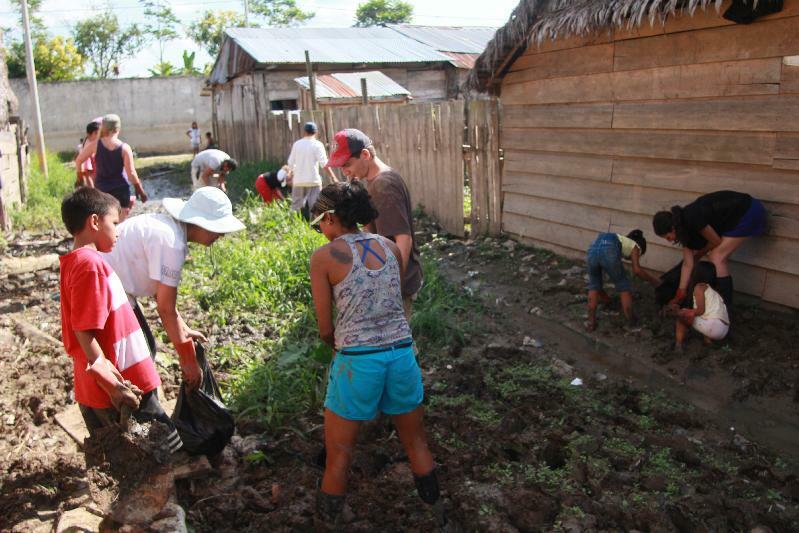 Already Knee Deep in Iquitos…Literally! 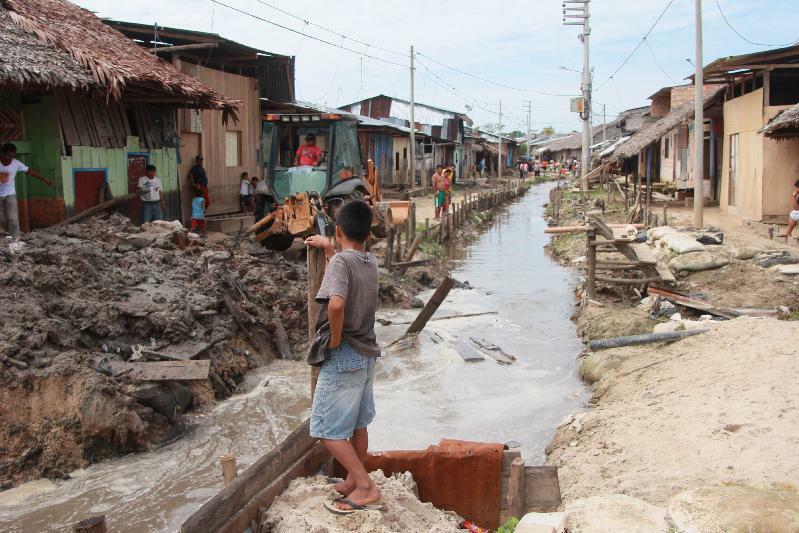 20 Jul Already Knee Deep in Iquitos…Literally! Hola from Iquitos! After traveling up Peru for several days via a grueling 30 hour bus ride, a quick sleep in an eyebrow raising hostel in the bustling town of Yurimaguas, and an endlessly surreal 3-day ferry ride, we have finally arrived in the jungle city of Iquitos! We have had a few days of settling into our routine, cooking delicious meals, exploring the fascinating city by 3-wheel motorcycle taxis and preparing for our major volunteer projects. The weekend ferry ride up the Amazon was peaceful and relaxing with hammock lounging, clusters of diamond stars, and beautiful green scenery. But of course, we faced a few challenges, such as cold winds at night, questionable boat food, rain that soaked everything, and adjusting to the whole no shower thing. However, tried and true backpackers that we are, we prevailed through it all and arrived in Iquitos pumped for the next phase of our adventure! Our time volunteering with the people of Pampachica has only just begun, and we can already tell that the experience–though long, muddy, sweaty days are ahead–is going to be impactful and mutually rewarding. 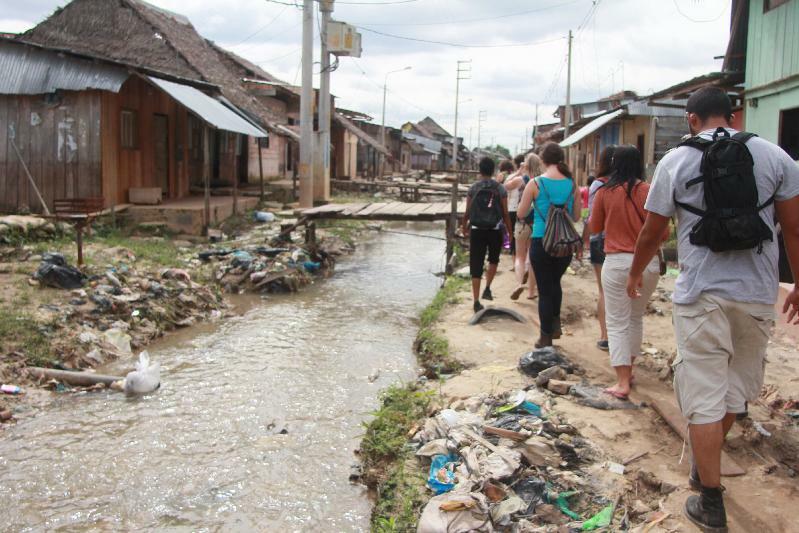 In this community just on the outskirts of Iquitos, we will be working with Kallpa Iquitos, a local NGO working on a healthy living campaign for the nine small towns there. Walking into the town of Villa Primero de Mayo on the first day. Volunteers and townspeople alike join together to tear down boards, pick up trash, and slick through the mud in order to work towards our goal of building a sustainable wall to help improve sanitary conditions for the community. Serving as a drainage trench for the entire area which completely flooded this past rainy season, a ditch of water packed with polluted trash and contaminated water runs through the middle of a town called Villa Primero de Mayo. In order to create a healthier, more livable environment, we are making the ditch deeper and implementing the envisioned wall to eradicate the damage done when flooding occurs. Communication is limited for a lot of us due to a fairly significant language barrier, but that’s no problem, especially as the children are concerned…they couldn’t be happier to connect with us all! Digging out the drainage trench that runs through the town. Our hostel at 955 Pablo Rosel, just outside the bustling city center, is quickly turning into a home that we are happy to call ours. With chats around the cooking smells of breakfast, late night treks for snacks around the neighborhood (Sublime and Fanta anyone? ), and constant laughter ringing from the dorms, our diverse little group is quickly turning into a family. We cannot wait to discover what the next four weeks hold for us all as we continue with our mission, first and foremost…backpacking with a purpose! Literally, knee deep on our first day of work! Jealous of what our Peru crew is up to? No worries! We’re heading back for another Amazon adventure in the fall. Apply today!